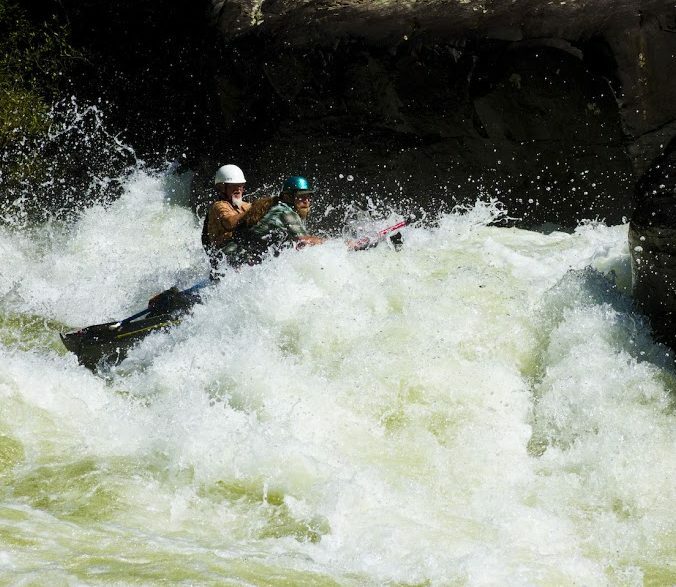 What makes the Gauley River’s Pillow Rock rapid “The Best 10 Seconds in American Whitewater”? “This is the best 10 seconds in American whitewater,” my raft guide told me the first time I ran the world-famous Upper Gauley River. We were floating in a calm pool above Pillow Rock Rapid, one of the Gauley’s famed Big 5, which also includes the Class V rapids Insignificant, Lost Paddle, Iron Ring and Sweet’s Falls. Of those 5, Pillow Rock is the big dog, making it the wildest ride on one of the biggest whitewater rafting stages on Earth. “This is the best 10 seconds in American whitewater,” she said again. Maybe more than any other rapid on this river, Pillow Rock can seem intimidating. You can see the rock down there, and you know its reputation. You’ve seen the photos, and you can hear it calling to you— more Kraken’s roar than mermaid’s song. You feel a growing sense of excitement before running Pillow Rock, and that feeling only intensifies, because once you’re in it, there is no middle ground— it can be a one-way ticket to glory. The ride gets faster and faster, more and more physical as it continues, until it dumps you into a trough known as “the Toilet Bowl.” Once you’re that far, you still have to navigate around Volkswagen Rock at the very bottom, which is famous for unceremoniously dumping boaters into the river. But by then, victory is literally within inches. The next few times I ran the Upper Gauley, I was on a riverboard, which is essentially a glorified boogie board— and come to think of it, I never actually saw Pillow Rock on any of those runs. The water throughout the rapid is so aerated that on a riverboard, I floated just below the surface, hanging on and kicking optimistically for each and every amazing ride. The Pillow Rock rapid is so exciting that scores of people happily hike a trail along a cliff 700 feet above the gorge just to watch. That’s where you get ringside seats to the action every weekend in Gauley Season, which starts the Friday after Labor Day and lasts through the 3rd weekend of October. It doesn’t sound like something that should be called, “the best 10 seconds in American whitewater,” does it? But between the moment a boat enters the top current of Pillow Rock Rapid to the second it passes Volkswagen Rock at the bottom, an amazing sequence of events unfolds. To spectators, a talented boatsman or boatswoman can make the run look like a skillful ballet of technique and control. At river level on the right bank, just downstream of the rapid, a raft or kayak starts by bobbing along at an impressive clip. Just before the Rock itself, the boat dips— and then its nose climbs up a massive pillow of water against the upstream side of the rock. If the boat is on an especially big line, it will ascend onto the rock, until it seems like any person in there could step out if they wanted. When it reaches the apex, the boat will plunge 10 feet or more down a slide and into the Toilet Bowl and disappear from sight for a long 2 seconds before punching the wave on the Bowl’s downstream side like a breaching nuclear submarine. Of course, if that doesn’t sound like the best 10 seconds of anything in the world to you, take a trip to the Lower Gauley River instead. Down there, the whitewater is still far from tame, but it’s certainly more friendly for beginners.